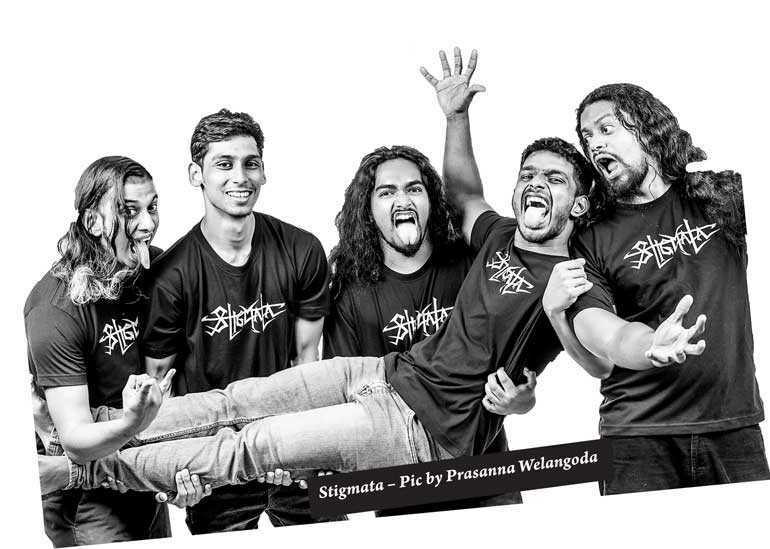 Sri Lankan Heavy Metal luminaries Stigmata have had a fabulous year in 2018. The band has performed a series of regular and consistent shows of impressive variety, from the 139th Battle of the Blues Royal-Thomian encounter, the Mosh Scream Rock festivals, the renewed Rock Saturdays to a number of intimate concerts at popular Clubs in Colombo like the Floor by O. Year 2018 has seen new doors of opportunity open for the five piece, the band has been busy engaging audiences on and off stage and having once again embraced social media to create a continuous flow of communication with its large and loyal following. If there was ever a concern of Stigmata’s fanbase dwindling after the departure of three of its members in late 2016, the band has not only successfully forged a momentous new sound, but have succeeded in reaching out to different crowds by performing at diverse concerts. One of the things that have raised a lot of buzz for the ensemble is that Stigmata have taken bold steps in performing rare cuts from their body of work of Four Full Length Albums, playing the obvious crowd pleasers while including anthems that are cherished but rarely performed on stage. Add an eclectic mix of new music and some carefully picked Tribute songs (the latest making waves been the band’s devastating rendition of Pantera’s “A New Level”) and you have a repertoire that’s exciting and unforgettable. The band caused a tidal wave a few months back with its new single release ‘Heavy is the Head that Wears the Crown’ with a Double Music Video release; one featuring Sri Lanka’s celebrated Cosplayer community in a fitting tribute to the Marvel opus Avengers: Infinity War and a stylised Lyric Video as well. Stigmata have now once again put Sri Lanka on the map, this time having been asked to submit “Heavy is the Head that Wears the Crown” for the Asian Music Awards staged by Channel Fix, a regional competition that enables any artist of any genre, style and language to enter. The winner stands a chance to work with international producer Sweden’s David Sivano while there are cash prizes up for grabs as well. The Asian Music Awards is a series of rounds, kick starting with two phases. The first phase is where 200+ artists from around Asia are selected by a panel of judges. Stigmata received a score of 8.6 out of 10 and qualified for the next phase which is based on a public voting system. An artist’s fans are encouraged to repeat vote every 24 hours as well and Stigmata who entered the second phase at no.55, shot to the top of the poll and was at Number 1 for 5 days straight. Sri Lanka’s Heavy Metal masters are currently at Number 2 on the Channel Fix network’s official countdown. The next phase is a Battle of the Bands Round where those who qualify must submit a second song plus music video and the ensemble is elated to announce that the multi-talented Randy Chriz Perera of Meraki United is helming and creating the second video for “An Idle Mind is the Devil’s Workshop” a hard hitting and catchy cut off the band’s “The Ascetic Paradox” album released in 2015. The song not only embodies the band’s uncompromising musical attack and great compositional depth, but also showcases the band’s roots in a Pure Sri Lankan Metal footprint with a range of musical styles fused into one neck breaking anthem. Though a lyric video was released for “An Idle Mind is the Devil’s Workshop” no official music videos were produced for what fans now fondly call the T.A.P. album and the band feels very strongly that the music on T.A.P. stands neck to neck with any international release. The Band is no stranger to international acclaim, even if it has gone mysteriously under the radar of the country’s widespread media conglomerates – from being the first Band of its ilk been based in Sri Lanka to open the international doorway for other likeminded acts touring and headlining a range of global festivals in Australia, New Zealand, Dubai, Bangladesh, India and Malaysia. Stigmata’s albums have received international acclaim often been selected by Webzines as a Top 10 Album of the Year. The Band notably also is the only Lankan based Metal act to be featured twice on the Discovery Channel and also on BBC Radio as a vital part of the country’s musical backdrop of originality and creativity. Love them or hate them, Stigmata for nearly two decades have carried the nation’s flag near and far and supporting them at the Asian Music Awards will certainly aid a deserving musical force to finally receive the recognition it has worked tirelessly for. Catch Stigmata live at The Floor by O tomorrow, Sunday 2 September, from 5 p.m. to 8 p.m. Tickets available at the gate Rs. 1,000 with Rs. 250 redeemable at the bar.